In the second of two transactions this year, Henbart has now assembled an almost 1.9-acre site at 1700 132nd Ave. N.E., a half-block from the future Bel-Red/130th Station in East Bellevue, where light rail service will begin in 2023. The company says it will hold the transit-oriented development (TOD) property in the near term for future development.The latest purchase was for $7.6 million, which King County recorded last week. Through an LLC, Henbart acquired the Ferguson Plumbing Supply building. Public records indicate a loan from First Republic Bank. The seller was an Oregon entity called 132nd Avenue LLC, which had owned the property for decades. In May, another Henbart LLC acquired the Coraggio Textiles building next door, at 1750 132nd, for $5.3 million. That brings the total investment to almost $13 million. The two deals were worth about $159 per square foot for the land. Brokers were not announced for either sale, and the two properties weren’t publicly listed. However, Henbart’s architect, Studio Meng Strazzara, did file a preliminary plan this year for two eight-story buildings with 355 units, 11,500 square feet of retail and 297 parking stalls (both structured and underground). Craig described it as a feasibility study. The project hasn’t yet entered into design review. Henbart’s site is north of Bel-Red Road and south of state Route 520. Unlike the Spring District, where Wright Runstad and other developers are creating a new TOD district on a single blank slate (the old Safeway distribution center), the upzoned area around Bel-Red/130th Station is dominated by individually owned old warehouses, retail and auto businesses. Most haven’t changed hands in years. One rare exception: the 2.8-acre Bellevue Tennis Academy building at 13201 N.E. Spring Blvd., which an LLC associated with the Wright family acquired in 2015 for $11.8 million. No plans have been filed yet for that property. Studio Meng Strazzara and Henbart previously worked together on 101 Broadway Ave. E. and The Commons at Ballard (winner of last year’s NAIOP Mixed-Use Development of the Year). 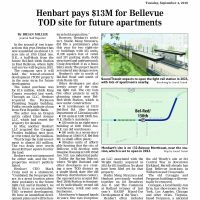 Henbart often includes Bartell stores in its projects, as in Ballard and its planned redevelopment of the old Wendy’s site at 312 Central Way in downtown Kirkland. Bartell already has East Bellevue locations in Wilburton and Crossroads. The old Coraggio and Ferguson buildings will eventually be removed. Coraggio, a local family-run firm, has showrooms in New York, Los Angeles, Chicago and other cities. Virginia-based Ferguson, a national chain, has local stores locations in Shoreline, Everett, Tacoma and Auburn.